Hi everyone! 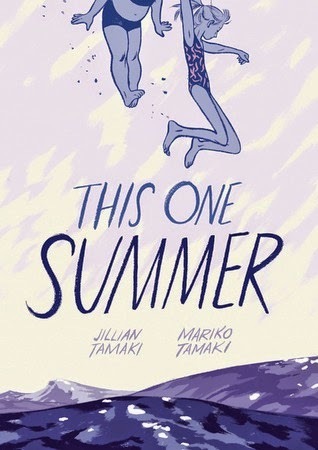 Today I get the pleasure of being part of the blog tour for This One Summer, a new graphic novel by Jillian Tamaki and Mariko Tamaki. You can check out the full tour schedule here. Mariko is here to talk about the music he listens to when he writes. Before we get to that, here’s a summary of the book, in case you haven’t heard of it. I know people who need complete silence to write, presumably so they can hear the muse, the voices in their heads, and so on. To me, when writing, silence is one of many soundtracks. Sometimes, on a spree, I need to unplug and read aloud to myself until it whatever I’m writing starts sounding like something other than mush. Most times, though, I’m a music person, and to me the perfect tune, for me, is the ultimate enabler. It is as important as a keyboard that doesn’t drive you crazy when your fingers hit the keys. Sometimes I listen to music because I just need to feel a little momentum, to hear what could be footsteps, the hustle and bustle of the world I’m writing about. For this I have a long list on top of which, currently, is Happy by Pharrell. There’s something about this song that just reads sunshine to me. To me this is the backdrop for writing about friends and those happy moments where everything is mostly going alright. Another great one for this mood is Little Dragon’s Shuffle a Dream, which has a nice steady beat to it. If I want to pick up the pace a little bit I’ll put on LCD Soundsystem’s All My Friends. If I’m finding the vocals distracting, which happens, I’ll put on Bernard Purdie’s If You Need Me, which is some drumming awesomeness. I don’t think you have to be sad to write sad. Usually I get sad when I’m writing something for the first time, which is super fun for the people around me. When I’m editing, or revisiting sad stuff, I’ll put a little sad music on so I can go there a little easier. I’m really loving the soundtrack for the movie Cloud Atlas for this, which is a really heart string pulling collection. I’ve used the Canadian band Metric a lot, which has a lot of that electro 80’s feel to it, which may say that a lot of the sad things I write have a bit of an electro 80’s feel to them too, which I’m okay with. On the less pop side there’s always Fleetwood Mac’s Landslide, which is a guaranteed magic bullet of sad for me, which is why I typically leave when it comes on at parties. For my most recent comic with Jillian, This One Summer, I drew pretty heavily on my Canadian Summer Tunes library, which was basically RUSH, The Beach Boys, Crosby Stills Nash and Young, and the Beatles. Because my summer jams were my dad’s jams, and ever that will be. Thanks so much Mariko for stopping by and sharing some of your favorite tunes! Be sure to pick up This One Summer if you haven’t already, and keep an eye out for my review later this month.